Nekhen is an Italian blackened doom solo project and this is his second release. This is a follow up to 2015’s Entering the Gate of the Western Horizon, which was an enjoyable example of present day music inspired by Egyptian art and culture. Regarding this latest release, I’ll let the artist himself explain; “The album is intended as a single song divided in 4 tracks, set in the western desert of Kemet in the 28th century BC, telling the last journey of an old man, facing a redeeming final ritual in an excruciating attempt to enter the western horizon as a justified”. 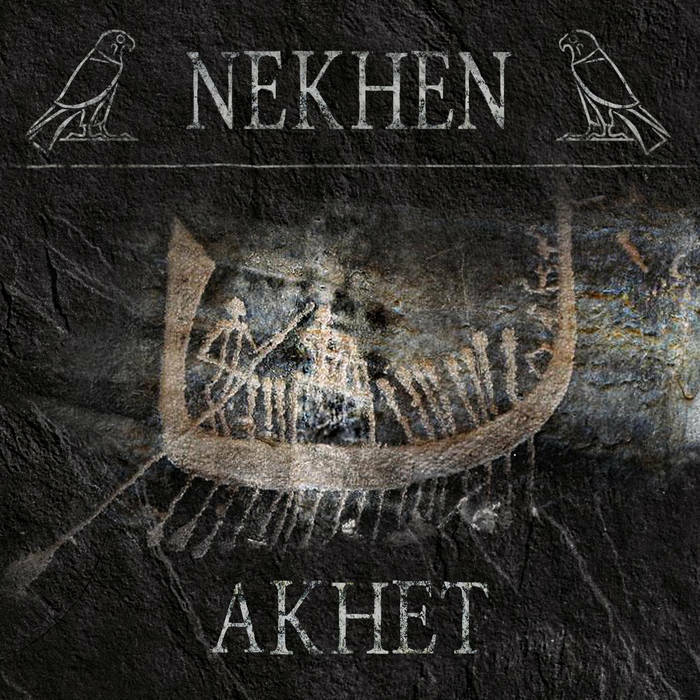 Akhet continues in the style of its predecessor, offering up 30 minutes of music that can loosely be termed as doom with aspects of blackened darkness. When comparing the two releases though, it must be stated that on this new album the artist has stepped up his game considerably. This release contains ethnic instruments and influences, enhancing the feeling of the album’s theme, and helping it come to a vibrant life. The music is rich and evocative, merging the Egyptian themes into the tapestry of the music in a natural and compelling way. Grand and epic, this is music that really does conjure up images of exotic lands and ancient times. Although Nekhen’s first release was instrumental, on this one there are vocals included, low in the mix and quite menacing and ritualistic in tone. They work very well. Thoroughly atmospheric and very well-constructed, Akhet is an accomplished piece of work that sees Nekhen take a big step up in quality and professionalism in all areas. This entry was posted in Doom and tagged Blackened Doom, Doom, Metal, Nekhen. Bookmark the permalink.